Dead Spacers who had the foresight to keep their old saved games lying around will be rewarded with immediate access to the original plasma cutter in Dead Space 2. The plasma cutter is one of my all-time favorite videogame weapons because it's not really designed to kill, it's designed to slice and dice. Arms, legs and heads are perhaps not the industrial applications the thing was originally intended for but it's awfully handy with them nonetheless; with upgrades, it slaughtered me through the vast majority of the first Dead Space and if I can root up a saved game somewhere, I'll be able to bring it to bear right from the word "go" in Dead Space 2. 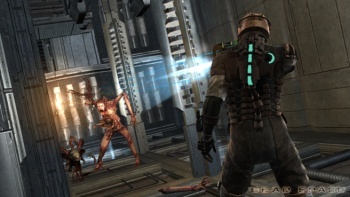 A message went up on the GameSpot forums on December 24 (and went largely overlooked thanks to the hectic holidays) from a user claiming he'd received an email from EA stating that anyone who had a "cleared game save" from Dead Space would be granted the original plasma cutter at the start of Dead Space 2. Then on December 31, Visceral Games programmer Louis Gascoigne clarified the matter a bit on Twitter, saying that any Dead Space save, from any point in the game, will unlock the plasma cutter. The bad news, however, is that it really is the "original" cutter, with no upgrades, so it won't be quite the late-game limb-slicing death machine you remember. The practical value of the unlock is debatable since the cutter is apparently pretty much the same in both games, but it is kind of a cool bone to throw to fans - at least, those who still have Dead Space kicking around somewhere. Dead Space 2 comes out on January 25 for the PC, PlayStation 3 and Xbox 360.